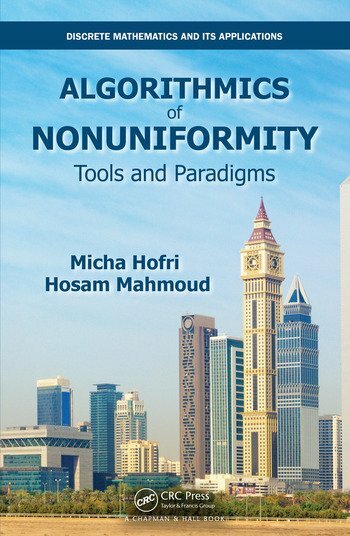 Algorithmics of Nonuniformity is a solid presentation about the analysis of algorithms, and the data structures that support them. Traditionally, algorithmics have been approached either via a probabilistic view or an analytic approach. The authors adopt both approaches and bring them together to get the best of both worlds and benefit from the advantage of each approach. The text examines algorithms that are designed to handle general data—sort any array, find the median of any numerical set, and identify patterns in any setting. At the same time, it evaluates "average" performance, "typical" behavior, or in mathematical terms, the expectations of the random variables that describe their operations. material complementing the content of the chapters. For this reason, the solutions are more than mere answers, but explain and expand upon related concepts, and motivate further work by the reader. Micha Hofri is a Professor of Computer Science, and former department head at Worcester Polytechnic Institute. He holds a Ph.D. of Industrial Engineering (1972), all from Technion, the Israel Institute of Technology. He has 39 publications in Mathematics. Hosam Mahmoud is a Professor at, the Department of Statistics at George Washington University in Washington D.C., where he used to be the former chair. He holds an Ph.D. in Computer Science from Ohio State University. He is on the editorial board of five academic journals. Micha Hofri is a professor of computer science, and former department head at Worcester Polytechnic Institute. He holds a Ph.D. of industrial engineering (1972), all from the Technion-Israel Institute of Technology. He has 39 publications in Mathematics. Hosam Mahmoud is a professor at the Department of Statistics at George Washington University in Washington D.C., where he is the former chair. He holds a Ph.D. in computer science from Ohio State University. He is on the editorial board of five academic journals.